2x8 in a Showman Head? Discussion in 'Amps/Cabs Tech Corner: Amplifier, Cab & Speakers' started by Stratosphere, Apr 6, 2008. A while back I ran across a Dual Fender Showman head at a music store (the big one from the 70's obviously) that had 2 8" speakers installed in it. I only had a few minutes to plug in and I didn't take time to get a good look at it the back of it. However, I was impressed with how it sounded and afterwards I was sorry I hadn't considered it more seriously. For such a compact rig with small speakers it stayed quite clean and I probably would have bought it if I had the money. I should have put it on layaway but by the time that occurred to me a couple days later it had been sold. I didn't have a chance to crank it but I got it up to a reasonably loud level and it sounded fine standing right next to it, probably turned up half way. I wouldn't be surprised if it was running at 50 watts at the volume produced, and the tremolo circuit had been disconnected. Possibly these were partly needed modifications to fit speakers inside. In any case, does anyone think it would be a worthwhile project to find a Showman head and to do this? My main concern would be mounting and baffling the speakers. I'm not sure if the speakers projected very well if one was listen away from the amp as it was set up. I'd probably add a small extension speaker cab if need be for playing with other people. The over all dimensions I believe are about 13 H 26 W, 9 D. For a very portable rig to pick up and go which retains keep a lot of headroom available I continue to find it an intriguing idea. My "Stumpy", made by my friend ParaDoc (ace amp tech) is a blueprinted BF Super in a SF Bandmaster Reverb head with 2-8s and a multitap transformer. Incredible tone with the high powered Eminence 8s, can also run thru an external cab (here, the 2-10 he built me) or w/ the external & internal speakers together (pants flap at several paces away). The "head" alone is a 40 watt 2x8 combo that will hang with anything I've seen. Not light, though, its about 55 lbs. (just the top piece). You will need some skill to get the baffle in there properly, it barely fits in th etall SF BMR cab, not sure about the Showman's height. I had heard of people using 6x9 speakers to accomplish the head with speaker(s). I have not heard either, but it sounds interesting, especially since you can always bypass them and play through a cab when the occasion calls for it. very hard for me to believe that any 6x9 I've ever seen is going to have the power handling capability and outstanding guitar tone of the high powered (75w) Eminence 8s in Stumpy. I was skeptical til I heard them and then I was merely dumbstruck & awed that they could sound so good. BTW, the bottom edge of the base of the cab had to be routed out slightly to allow the bottom of the 2-8s to slide in there in front of & below the chassis. It's a tight fit but a brilliant result by my friend. Didn`t work for me . I had Ted Weber make me the toughest 6x9 he could . 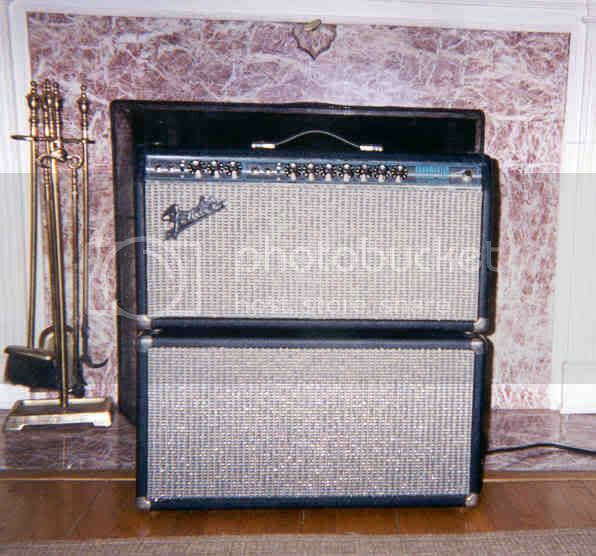 Put it in a Princeton Reverb head cab that wouldn`t fit an 8 "
Really bright (hifi brite) and farted out at the slightest bass volume (dial on 2) ...An amp higher powered than a Princeton would mutilate that sucker just flipping the power switch on . I knew that at one time Ted was working on a 6x9 to use as a guitar speaker. If someone could make it work out, I would think it would be Ted.